Welcome to the first installment of LauraLovesFitness! It seems only fitting I am launching my blog during my favorite time of the year. Summer gives us 13 whole weeks to take our favorite moves from the gym to the outdoors. This is your chance to mix things up and turn that next trip to the beach or park into some muscle-moving fun. As you pack up the sunscreen and healthy snacks, toss a Frisbee into your backback or beach tote. 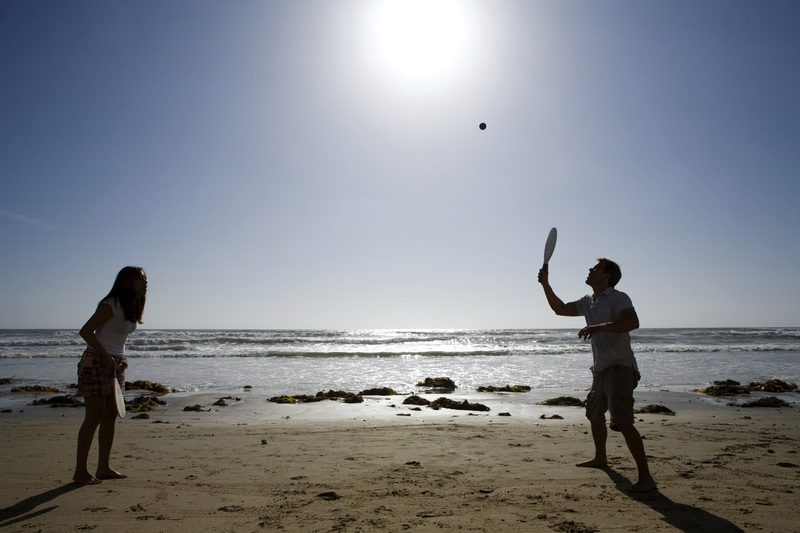 Or you could give paddle ball (my all-time favorite beach game!) a whirl. Keeping that little rubber ball in the air provides a great workout for everything from your glutes, quads, calves, core muscles and your arms. For a real challenge, try “switch hitting” with your paddle. The best part? When it gets too hot, you can take a dip and cool off! 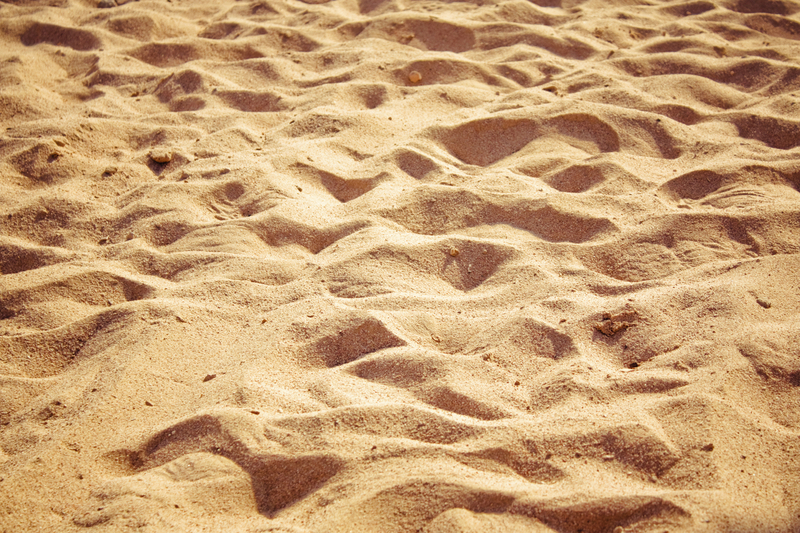 A note of caution: if you’re suffering from a foot, ankle or knee injury, remember sand is an unstable surface. While that creates extra calorie-burning opportunities as your body works harder to stay balanced, it puts extra pressure on an injured area. I am currently struggling to recover from a stress fracture in my left foot and had to be extra careful on a recent trip to Florida. What helped me? Wearing my sneakers (along with orthotics) while walking on the beach. They may not look as cute as flip-flops, but they did help me maintain stability and also took some pressure off the injured metatarsal and inflamed joint. If your idea of outdoor fun is more along the lines of a picnic in the park, Frisbee and paddle ball can be played on the grass, too. 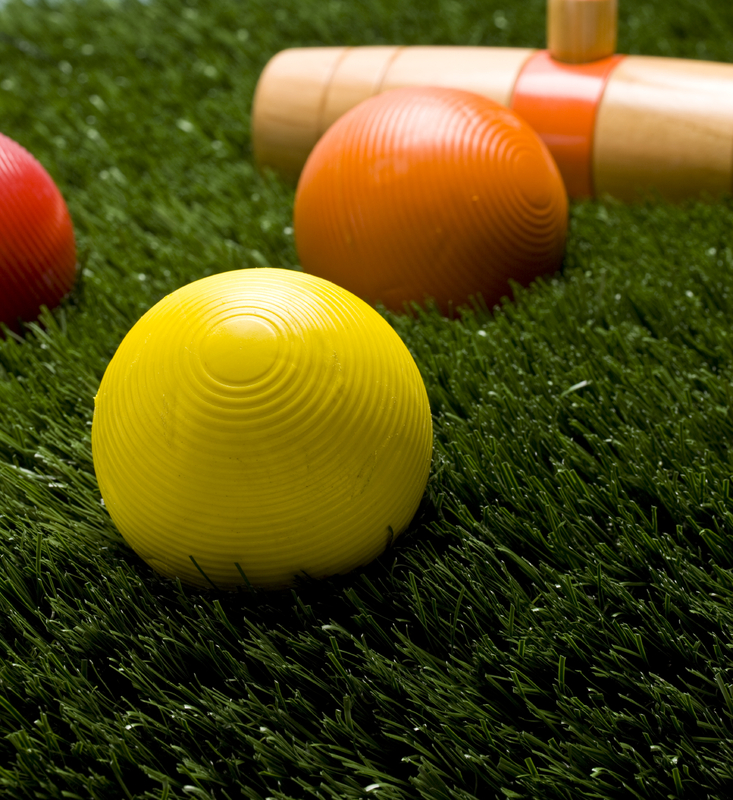 Or why not test your skills at whiffle ball or croquet? Check out your local sports store for plenty of portable games that provide fun for multiple skill-levels. You’ll also feel better digging into the picnic fare knowing you burned some calories beforehand! Drink plenty of non-alcoholic fluids, preferably water. Don’t forget the waterproof, sweat-proof sunscreen. While sore muscles from a game of beach volleyball can be rewarding, a sunburn never feels good! Finally – don’t forget to stretch! After giving those arms and legs a good workout, static or active-isolated stretches can help the body recover. Remember: static stretches need to be held for a minimum of 20 seconds. Here’s to a fit and fabulous summer! Posted on July 13, 2011, in Fitness, Health and tagged Fitness, Frisbee, Injury Management, Laura DeAngelis, Outdoors, paddle ball, stretching, whiffle ball. Bookmark the permalink. 15 Comments. Great tips for all those fitness types! Or just people looking to have a good time this summer. I’ll be sure to share! Glad to see you up and blogging! Thank you, Paula! I look forward to sharing tips to help our readers stay fit and organized! Wait, there’s another Paula in your life? Just kidding… so proud of you. It inspires me to spend more time outside active with the kids at this time of the year, than shuffling to and from activities in the car. Hello Paula from the 5th grade! Thank you for your note! I’m so glad my first post inspired you to move a bit more – although I must say those gorgeous children of yours keep you running around quite a bit already! Congratulations Laura! I’m already hooked! You most certainly have put in the time and effort as your site is perky, professional, interesting and relevant. I’ll be sure to pass the word along to my friends/family. Kudos! Hi Debbie! Many thanks for your message. So glad to know my blog resonated well with a fitness buff like yourself! I hope you and your friends and family find it fun and helpful. You are certainly an inspiration! Great start, Laura! Hey there, Marylou! Many thanks for the kind words. I always love an adventure! Hope to see you soon! Great information – especially working through an injury. Can’t wait for the next installement…I have signed up! Thank you, Jeannine! As you know, I have plenty to share in the injury department! laura, your site is awesome. Can’t wait to read future posts. I have been doing vinyasa yoga 3 times a week and think I have finally replaced running with a more gentle but still extremely rewarding workout. Thoughts? Hello Evva! Thank you for the kind note and for supporting my latest project! I think it is terrific you are doing yoga three times a week. The fact that you are doing any type of activity three times a week is fantastic. The fact that you find yoga rewarding is the best part. In the past several years, I’ve started learning to really listen to my body and it sound like you are doing the same. There are things I did in my 20s that I simply cannot do today without having to pop ibuprofen and take more time off to recuperate than I’d like. So you make adjustments, try and correct what you’ve been doing wrong and move ahead – and it sounds like that’s what you’ve done. So, I say stick with the yoga, and get in 30-minutes of cardio with either runs or power walking when you can and have fun! Hi Laura, I’m Debbie Staw’s sister Ellen. Great new blog and concept… I suppose if you’re having fun, being fit and feeling fabulous… looking good might be a natural result? Let’s hope! I believe I met you at Amy & Jeffrey’s engagement party way back. You’re so beautiful! Maybe you could share some of your hair, fashion, beauty tips along the way too! Hello Ellen, How nice to hear from you! Thank you for checking out my blog! You are very kind! As I get my groove going with my blog, I’d be happy to throw out some general lifetsyle tips if you and my other readers would like to hear them. If you ever have a particular question, please don’t hesitate to ask. Wishing you a wonderful weekend! such as yours require a lot of work? I’m completely new to blogging however I do write in my diary everyday. I’d like to start a blog so I will be able to share my own experience and thoughts online.